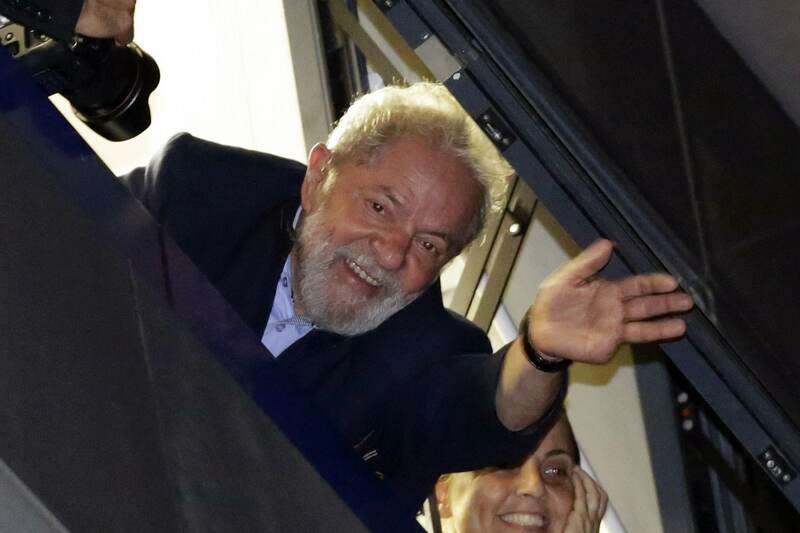 Brazil's Workers' Party (PT) formalized Luiz Inacio Lula da Silva's presidential candidacy at its National Convention in Sao Paulo on Saturday, despite him being unjustly imprisoned on corruption charges since April 7. The 72-year-old leftist former president is leading all opinion polls for the October presidential elections by a wide margin and the PT is going all in with his candidacy, but his supporters will have to wait until the electoral tribunal (TSE) rules on whether he can run. "Lula is our candidate for the republic's presidency," said Gleissi Hoffmann, PT president. A candidate for the vice presidency has yet to be named. Lula sent a message from prison that was read during the convention, telling the party that "Brazil needs to recover its democracy" and all the conquests that the people seem to be losing under Temer's neoliberal government. "We arrived at the government through a vote, after a lot of learning, to transform Brazil – and we transformed it," Lula wrote in the message. "We defeated misery and hunger. We brought water to the thirsty and electricity to the ones living in the shadows. We took the children to schools and the young – Black, poor and Indigenous – to the universities." Lula referenced the parliamentary coup against his successor, Dilma Rousseff, and warned the Brazilian people that the incumbent government is trying to build "democracy without people." Lula is currently serving a 12-year sentence for passive corruption and money laundering, charges he has consistently denied. Despite his imprisonment, he remains the front-runner with about 30 percent of the vote intention. Meanwhile, Senate-imposed President Michel Temer's Brazilian Democratic Movement named former Finance Minister Henrique Meirelles as its presidential candidate, who currently has one percent of the vote intention. On Friday, the PT presented the program for Lula's government (2019-2022), divided into eight sections. The document addresses crucial issues for the South American giant to recover from the impeachment of Rousseff, followed by the administration of Michel Temer, including inflation, unemployment and the rise of extreme poverty. The government will aim for a simplified and fairer tax system. * Tax on consumer goods will be reduced. * Those earning up to five times the minimum wage per month will be exempt from Personal Income Tax, as well as taxes on profit, dividends and main assets distribution. * Loans at low, fair interest rates will be available for those in need. * Resumption of a foreign policy focused on regional integration and multilateral dialogue. * Promote democracy, pluralism and media diversity, aiming for the harmonious interaction between public authorities engaged in ample debate from civil society. * Empower citizens through the tools made available by the constitution, such as plebiscites and referendums. Citizens' rights were deeply affected as a consequence of the parliamentary coup against former President Dilma Rousseff. * This element involves the interdependency between democracy and human rights, as well as combating the criminalization of social movements. * Policies centered on women and the promotion of racial equality, as well as the rights of the young, the LGBTI community, the elderly, people with disabilities, Indigenous peoples, and natural resources. Lula will work for the defense and promotion of society's right to communication. * Media should be free from government and economic groups' control, guaranteeing freedom of speech, pluralism and access to diverse sources of information. * A new legal framework for social media communication will be presented. * Strengthen the importance of broadband universal access, the consolidation of an Internet's Civil Framewok, the strengthening of community radio and television and diversification of public investment on media. * The poorest of society will be a priority again for the federal, state and municipal administrations, using a new public administration and recognizing local institutional limitants. * It strategically addresses educational and healthcare needs. * The elimination of extreme poverty as top priority. The sixth point deals directly with the 'ecological transition for a new, 21st century society' and building a fair economy low on carbon use, after Temer's de facto government promoted irresponsible use of natural resources. * A low environmental impact and high added value economy will be promoted, always guaranteeing right to healthy nutrition, water and sanitation. * The right to the city will be guaranteed, as well as the renewal of urban development programs, access to housing, mobility and efficient disposal of wastes. * Overall, the new ecology policy will include valuing small-scale family farming, the democratization of land access, agrarian reform, the reduction of agro-toxins, the production of health foods, as well as the defending human rights in rural areas. * Middle and high school education will be promoted. * The education reform of Michel Temer's government will be derogated in favor of a new legal framework for dialogue, including training new elementary level teachers and expanding comprehensive education. * The S System will be reformed in order to give youths access to technical and professional education. * The Middle Level Federal Education Program will promote the integration between the Federal Integration Network and elementary level education, strengthening the education, sciencie and technology federal institutes. * Promoting structural reforms and reaffirming the democratic victories of the 1988 constitution. * To trigger a free, democraic, sovereign and single chamber constituent process, as a result of an intense debate on the future of the nation. Combined, the eight-point program seeks to rescue the national achievements made by Lula and Dilma, both members of the Workers’ Party, and present a new, more robust agenda for the people of Brazil.